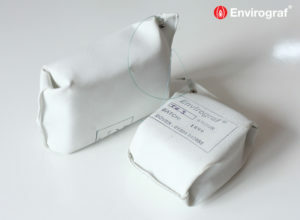 This fireproof sponge is incombustible, emits no toxic fumes, and slowly degrades in a fire, providing an extremely effective fire-stopping barrier. Supplied in standard strips and sheets. Larger F sponge in sheet form – 1 metre x 1 metre and 1 metre x 2 metre. For ½ hour – 30mm into wall. For 1 hour – 50mm into the wall. For 2 hours – 70mm into the wall. For 4 hours – 100mm into the wall. Can be supplied in greater thickness. For profile sections either cut to size, ready to fit for one hour and two hour protection, or in one metre lengths for one or two hour protection to cut on site to the required depth. Just compress and fit into the opening. 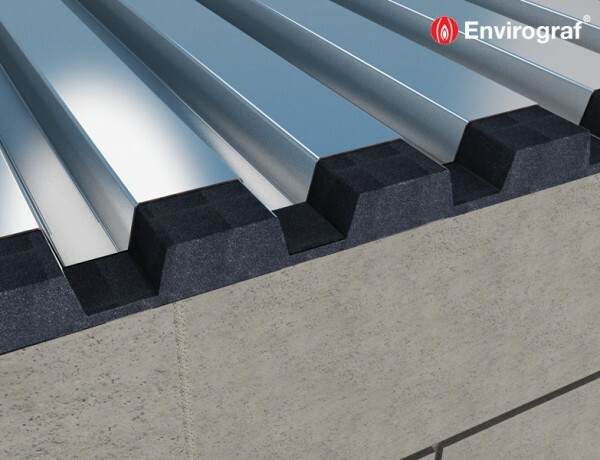 The sponge can be used under roofing sheets, between walls and floors, or as packing around small openings and can be faced with Envirograf® CF Cement Filler (Product 63). The sponge is also available in sheet form. supplied with a white coating on one face. MPFX is for one hour protection only and is supplied in one metre lengths (D = 1000mm). For special sponge profiles in 1 metre lengths, state the measurements A, B, and C when contacting the sales department. Tested to BS476 Part 22 (1987), achieving an integrity of 138 minutes.